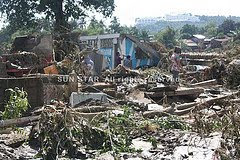 My Life and Activities here in KSA..: Typhoon Sendong Aftermath..
At the height of Sendong’s onslaught on Friday, the Cagayan de Oro river reportedly overflowed, sending the residents to their roofs or troop to the nearest evacuation centers for safety. The flashfloods caught the residents by surprise since they were asleep, according to Benito Ramos, National Disaster Risk Reduction and Management Council (NDRRMC) executive director. "The flooding occurred around 2:30 a.m. while the people were sleeping. It (massive rains) caused the silted river system to overflow," Ramos added. Some 20,000 people are currently taking shelter in evacuation centers in the city, according to Cagayan de Oro Representative Rufus Rodriguez. Power and water connections have also been cut off as of this posting. 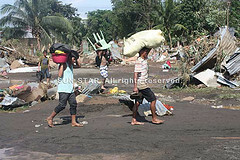 In Iligan City, authorities said at least 144 people were killed due to the storm. Iligan City Mayor Lawrence Cruz said more than 12 hours of continuous rain over Iligan, as well as water from nearby mountains, had raised floodwaters waist-high in some neighborhoods that do not usually experience flooding. Scores of residents escaped the flood by climbing onto the roofs of their homes, he said. Cruz said the Coast Guard and other rescuers were scouring the waters off in the city for survivors or bodies that may have been swept to the sea by a swollen river. Those missing included prominent radio broadcaster Enie Alsonado, who was swept away while trying to save his neighbors, Cruz said. Five people were also killed and one is missing in Mt. Diwalwal in Monkayo town, Compostela Valley. The five fatalities were killed when a landslide struck the gold-rush area of Mt. Diwata. The victims were identified as Rosita dela Peña, 57 years old; Nasser Tuan, 6; Rakima Tuan, 4; Asliya Tuan, 14; and Jolito Lumactod, 28. The landslide struck around 4 p.m. Friday at Purok 21 in Barangay Mt. Diwata and destroyed the houses of the victims. Around 134 families were affected by the flashflood and landslide in several areas at Monkayo. In the progress report from the Army's 10th Infantry Division, affected barangays include Poblacion, Barangay Baylo, Barangay Pasian, Barangay Union, Barangay Salvacion, and Barangay Mt. Diwata. Major Rosa Maria Cristina Manuel, of the Army's 10th Infantry Division, said due to constant heavy rain, rivers and tributaries on the place overflowed where some five houses have been washed out by the flashflood. Manuel added that there were seven puroks in Barangay Mt. Diwata affected in landslide, though there are no casualties on the incident, but there were reportedly missing. She said the Peace and Development Teams of the Army's 25th Infantry Battalion were deployed in the barangays so as to take part in the evacuation of the flashflood-affected families. In Baungon town in Bukidnon, at least 12 persons have been confirmed dead and hundreds went missing while the road from Cagayan de Oro City to Talakag in Bukidnon is impassable due to landslide. The Kabula Bridge in Baungon was also damaged. Relief goods have been distributed to the flood victims along with other private agencies, while Xavier University had also set up a relief center and an information desk, especially for its employees and students who were affected by the calamity. In Manila, Social Welfare and Development Secretary Corazon "Dinky" Soliman assured enough relief supplies to be distributed to affected communities. Relief goods will be turned over to the local government units (LGUs) as social welfare and development teams are on alert to monitor hazard-prone areas, especially those living along the coasts, she said. A standby fund worth P300 million will also be released to ensure delivery of assistance to storm victims. Meanwhile, Ramos said that the death toll may still go up, especially that around hundreds remain unaccounted for. "We expect the death toll to go up because the mechanized infantry battalions have reported that more bodies were found," he told state-run Radyo ng Bayan on Saturday. Meanwhile, President Benigno Aquino III wants a review of the government’s disaster response manual to prevent unnecessary loss of lives in the aftermath of the devastation of Sendong in Mindanao. Several government agencies in Camp Aguinaldo on Saturday briefed the President regarding their response to the devastation brought about by the storm. The Chief Executive also wants a more accurate and effective typhoon tracking system so that communities along typhoon path could have enough time to prepare before such disturbance hits. Areas vulnerable to flashfloods must be identified for the government to issue immediate warnings during heavy downpours and typhoons, Aquino said. With regard to the current search and rescue efforts, police and military officials told the President about the need for more rubber boats for their missions. They said rescue efforts as well as salvaging dead bodies will continue once the weather improves. The Philippine Atmospheric Geophysical and Stronomical Services Administration (Pagasa) said Sendong made another landfall in the vicinity of Puerto Princesa City before dawn Sunday and is now heading towards the West Philippine Sea. As of 4 a.m. Sunday, Sendong was spotted at 60 kilometers west northwest of Puerto Princesa City, packing maximum winds of 65 kilometers per hour (kph) near the center and gustiness up to 80 kph. Sendong is forecast to move west at 24 kph and is expected to exit the Philippine Area of Responsibility by Sunday evening. Our Simple Noche Buena..Merry Christmas guys! !